This appendix details the XML Schema-based configuration introduced in Spring 2.0. Authoring Spring configuration files using the older DTD style is still fully supported. Nothing will break if you forego the use of the new XML Schema-based approach to authoring Spring XML configuration files. All that you lose out on is the opportunity to have more succinct and clearer configuration. Regardless of whether the XML configuration is DTD- or Schema-based, in the end it all boils down to the same object model in the container (namely one or more BeanDefinition instances). The central motivation for moving to XML Schema based configuration files was to make Spring XML configuration easier. The 'classic' <bean/>-based approach is good, but its generic-nature comes with a price in terms of configuration overhead. From the Spring IoC containers point-of-view, everything is a bean. That's great news for the Spring IoC container, because if everything is a bean then everything can be treated in the exact same fashion. The same, however, is not true from a developer's point-of-view. The objects defined in a Spring XML configuration file are not all generic, vanilla beans. Usually, each bean requires some degree of specific configuration. Spring 2.0's new XML Schema-based configuration addresses this issue. The <bean/> element is still present, and if you wanted to, you could continue to write the exact same style of Spring XML configuration using only <bean/> elements. The new XML Schema-based configuration does, however, make Spring XML configuration files substantially clearer to read. In addition, it allows you to express the intent of a bean definition. The key thing to remember is that the new custom tags work best for infrastructure or integration beans: for example, AOP, collections, transactions, integration with 3rd-party frameworks such as Mule, etc., while the existing bean tags are best suited to application-specific beans, such as DAOs, service layer objects, validators, etc. The examples included below will hopefully convince you that the inclusion of XML Schema support in Spring 2.0 was a good idea. The reception in the community has been encouraging; also, please note the fact that this new configuration mechanism is totally customisable and extensible. This means you can write your own domain-specific configuration tags that would better represent your application's domain; the process involved in doing so is covered in the appendix entitled Appendix B, Extensible XML authoring. To switch over from the DTD-style to the new XML Schema-style, you need to make the following change. The 'xsi:schemaLocation' fragment is not actually required, but can be included to reference a local copy of a schema (which can be useful during development). The above Spring XML configuration fragment is can pretty much be considered boilerplate; you can simply use this and continue to write <bean/> definitions like you have always done. However, the entire point of switching over is to take advantage of the new Spring 2.0 XML tags since they make configuration easier. The section entitled Section A.2.2, “The util schema” demonstrates how you can start immediately by using some of the more common utility tags. The rest of this chapter is devoted to showing examples of the new Spring XML Schema based configuration, with at least one example for every new tag. The format follows a before and after style, with a before snippet of XML showing the old (but still 100% legal and supported) style, followed immediately by an after example showing the equivalent in the new XML Schema-based style. First up is coverage of the util tags. As the name implies, the util tags deal with common, utility configuration issues, such as configuring collections, referencing constants, and suchlike. To use the tags in the util schema, you need to have the following preamble at the top of your Spring XML configuration file; the emboldened text in the snippet below references the correct schema so that the tags in the util namespace are available to you. The above configuration uses a Spring FactoryBean implementation, the FieldRetrievingFactoryBean, to set the value of the 'isolation' property on a bean to the value of the 'java.sql.Connection.TRANSACTION_SERIALIZABLE' constant. This is all well and good, but it is a tad verbose and (unneccessarily) exposes Spring's internal plumbing to the end user. The following XML Schema-based version is more concise and clearly expresses the developer's intent ('inject this constant value'), and it just reads better. It is also possible to access a non-static (instance) field of another bean, as described in the API documentation for the FieldRetrievingFactoryBean class. This works for classic type-safe emulated enums (on JDK 1.4 and JDK 1.3) as well; Spring will automatically attempt to match the string property value to a constant on the enum class. The above configuration uses a Spring FactoryBean implementation, the PropertyPathFactoryBean, to create a bean (of type int) called 'testBean.age' that has a value equal to the 'age' property of the 'testBean' bean. The value of the 'path' attribute of the <property-path/> tag follows the form 'beanName.beanProperty'. The above configuration uses a Spring FactoryBean implementation, the PropertiesFactoryBean, to instantiate a java.util.Properties instance with values loaded from the supplied Resource location). The above configuration uses a Spring FactoryBean implementation, the ListFactoryBean, to create a java.util.List instance initialized with values taken from the supplied 'sourceList'. If no 'list-class' attribute is supplied, a List implementation will be chosen by the container. Finally, you can also control the merging behavior using the 'merge' attribute of the <util:list/> element; collection merging is described in more detail in the section entitled Section 3.3.3.4.1, “Collection merging”. The above configuration uses a Spring FactoryBean implementation, the MapFactoryBean, to create a java.util.Map instance initialized with key-value pairs taken from the supplied 'sourceMap'. If no 'map-class' attribute is supplied, a Map implementation will be chosen by the container. Finally, you can also control the merging behavior using the 'merge' attribute of the <util:map/> element; collection merging is described in more detail in the section entitled Section 3.3.3.4.1, “Collection merging”. The above configuration uses a Spring FactoryBean implementation, the SetFactoryBean, to create a java.util.Set instance initialized with values taken from the supplied 'sourceSet'. If no 'set-class' attribute is supplied, a Set implementation will be chosen by the container. Finally, you can also control the merging behavior using the 'merge' attribute of the <util:set/> element; collection merging is described in more detail in the section entitled Section 3.3.3.4.1, “Collection merging”. To use the tags in the jee schema, you need to have the following preamble at the top of your Spring XML configuration file; the emboldened text in the following snippet references the correct schema so that the tags in the jee namespace are available to you. The <jee:local-slsb/> tag configures a reference to an EJB Stateless SessionBean. The <jee:remote-slsb/> tag configures a reference to a remote EJB Stateless SessionBean. These tags (and the dynamic language support) are comprehensively covered in the chapter entitled Chapter 24, Dynamic language support. Please do consult that chapter for full details on this support and the lang tags themselves. In the interest of completeness, to use the tags in the lang schema, you need to have the following preamble at the top of your Spring XML configuration file; the emboldened text in the following snippet references the correct schema so that the tags in the lang namespace are available to you. The tx tags deal with configuring all of those beans in Spring's comprehensive support for transactions. These tags are covered in the chapter entitled Chapter 9, Transaction management. You are strongly encouraged to look at the 'spring-tx-2.0.xsd' file that ships with the Spring distribution. This file is (of course), the XML Schema for Spring's transaction configuration, and covers all of the various tags in the tx namespace, including attribute defaults and suchlike. This file is documented inline, and thus the information is not repeated here in the interests of adhering to the DRY (Don't Repeat Yourself) principle. In the interest of completeness, to use the tags in the tx schema, you need to have the following preamble at the top of your Spring XML configuration file; the emboldened text in the following snippet references the correct schema so that the tags in the tx namespace are available to you. Often when using the tags in the tx namespace you will also be using the tags from the aop namespace (since the declarative transaction support in Spring is implemented using AOP). The above XML snippet contains the relevant lines needed to reference the aop schema so that the tags in the aop namespace are available to you. The aop tags deal with configuring all things AOP in Spring: this includes Spring's own proxy-based AOP framework and Spring's integration with the AspectJ AOP framework. These tags are comprehensively covered in the chapter entitled Chapter 6, Aspect Oriented Programming with Spring. In the interest of completeness, to use the tags in the aop schema, you need to have the following preamble at the top of your Spring XML configuration file; the emboldened text in the following snippet references the correct schema so that the tags in the aop namespace are available to you. The tool tags are for use when you want to add tooling-specific metadata to your custom configuration elements. This metadata can then be consumed by tools that are aware of this metadata, and the tools can then do pretty much whatever they want with it (validation, etc.). The tool tags are not documented in this release of Spring as they are currently undergoing review. If you are a third party tool vendor and you would like to contribute to this review process, then do mail the Spring mailing list. The currently supported tool tags can be found in the file 'spring-tool-2.0.xsd' in the 'src/org/springframework/beans/factory/xml' directory of the Spring source distribution. Last but not least we have the tags in the beans schema. These are the same tags that have been in Spring since the very dawn of the framework. Examples of the various tags in the beans schema are not shown here because they are quite comprehensively covered in the section entitled Section 3.3.3, “Bean properties and constructor arguments detailed” (and indeed in that entire chapter). One thing that is new to the beans tags themselves in Spring 2.0 is the idea of arbitrary bean metadata. In Spring 2.0 it is now possible to add zero or more key / value pairs to <bean/> XML definitions. What, if anything, is done with this extra metadata is totally up to your own custom logic (and so is typically only of use if you are writing your own custom tags as described in the appendix entitled Appendix B, Extensible XML authoring). Find below an example of the <meta/> tag in the context of a surrounding <bean/> (please note that without any logic to interpret it the metadata is effectively useless as-is). In the case of the above example, you would assume that there is some logic that will consume the bean definition and set up some caching infrastructure using the supplied metadata. This final section documents the steps involved in setting up a number of popular Java IDEs to effect the easier editing of Spring's XML Schema-based configuration files. If your favourite Java IDE or editor is not included in the list of documented IDEs, then please do raise an issue and an example with your favorite IDE/editor may be included in the next release. The following steps illustrate setting up Eclipse to be XSD-aware. The assumption in the following steps is that you already have an Eclipse project open (either a brand new project or an already existing one). The following steps were created using Eclipse 3.2. The setup will probably be the same (or similar) on an earlier or later version of Eclipse. Create a new XML file. You can name this file whatever you want. In the example below, the file is named 'context.xml'. Copy and paste the following text into the file so that it matches the screenshot. 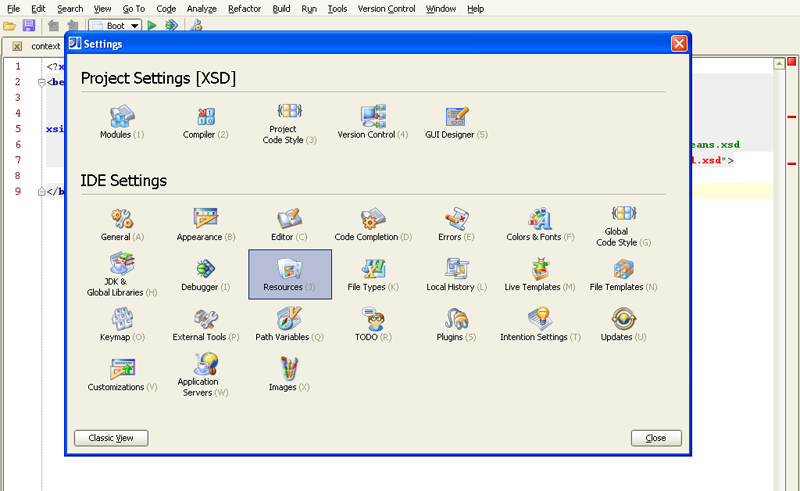 Patches showing how to configure an Eclipse XML editor are welcomed. Any such contributions are best submitted as patches via the Spring Framework JIRA Issue Tracker and may be featured in the next release. Unfortunately, precisely because there is no standard XML editor for Eclipse, there are (bar the one below) no further steps showing you how to configure XML Schema support in Eclipse... each XML editor plugin would require its very own dedicated section, and this is Spring reference documentation, not Eclipse XML editor documentation. You will have to read the documentation that comes with your XML editor plugin (good luck there) and figure it out for yourself. The following steps illustrate setting up the IntelliJ IDEA IDE to be XSD-aware. The assumption in the following steps is that you already have an IDEA project open (either a brand new project or an already existing one). Repeat as required for setting up IDEA to reference the other Spring XSD files. Create a new XML file (you can name this file whatever you want). In the example below, the file is named 'context.xml'. Copy and paste the following text into the file so that it matches the screenshot. As can be seen in the above screenshot, the XML file has a number of nasty red contextual error markers. To rectify this, IDEA has to be made aware of the location of the referenced XSD namespace(s). To do this, simply position the cursor over the squiggly red area (see the screenshot below); then press the Alt-Enter keystroke combination, and press the Enter key again when the popup becomes active to fetch the external resource. If the external resource could not be fetched (maybe no active Internet connection is available), you can manually configure the resource to reference a local copy of the XSD file. Simply open up the 'Settings' dialog (using the Ctrl-A-S keystroke combination or via the 'File|Settings' menu), and click on the 'Resources' button. Clicking the 'Add' button will bring up another dialog that allows you to explicitly to associate a namespace URI with the path to the relevant XSD file. As can be seen in the following screenshot, the 'http://www.springframework.org/schema/util' namespace is being associated with the file resource 'C:\bench\spring\src\org\springframework\beans\factory\xml\spring-util-2.0.xsd'. Exiting out of the nested dialogs by clicking the 'OK' button will then bring back the main editing window, and as can be seen in the following screenshot, the contextual error markers have disappeared; typing the '<' character into the editing window now also brings up a handy dropdown box that contains all of the imported tags from the util namespace. This final section details integration issues that may arise when you switch over to using the above XSD-style for Spring 2.0 configuration. This section is quite small at the moment (and hopefully it will stay that way). It has been included in the Spring documentation as a convenience to Spring users so that if you encounter an issue when switching over to the XSD-style in some specific environment you can refer to this section for the authoritative answer. If you are using the XSD-style for Spring 2.0 XML configuration and deploying to v.3 of Caucho's Resin application server, you will need to set some configuration options prior to startup so that an XSD-aware parser is available to Spring. Please do read this resource, http://www.caucho.com/resin-3.0/xml/jaxp.xtp#xerces, for further details.